Do you all know Mandy? She is such a sweetheart! Her blog is full of mouth-watering recipes. I guarantee if you visit her, you will leave with at least one (or 5) things on your recipe list! Plus she was one of the first people to support me when I started Back For Seconds – you don’t forget someone like that! 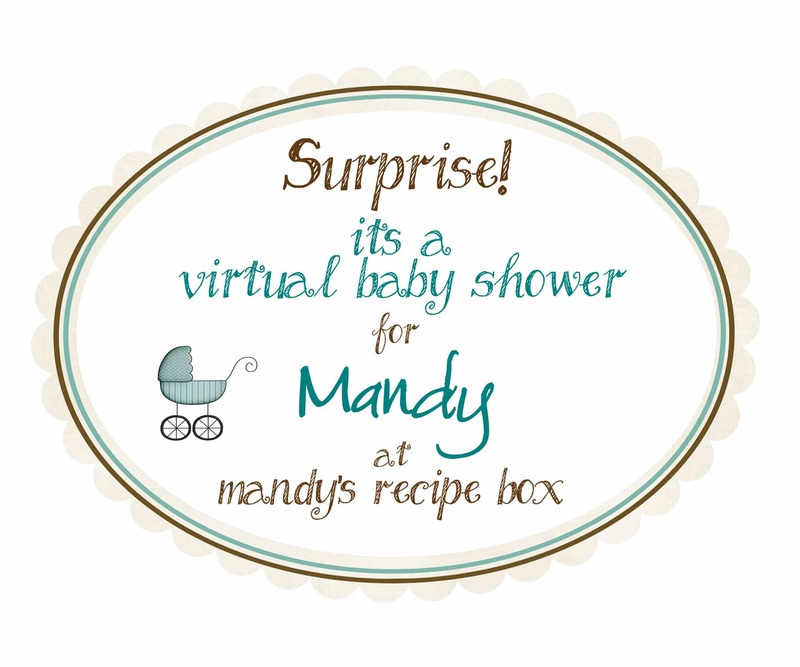 She is about to have another baby, and we just love her, here in blog land, so Holly from Life as a Lofthouse put together this virtual baby shower for her! SURPRISE!! I am usually not a big sweets eater unless it’s chocolate, but these were unbelievably good! The cookie is so light and cakey, buttery and soft. 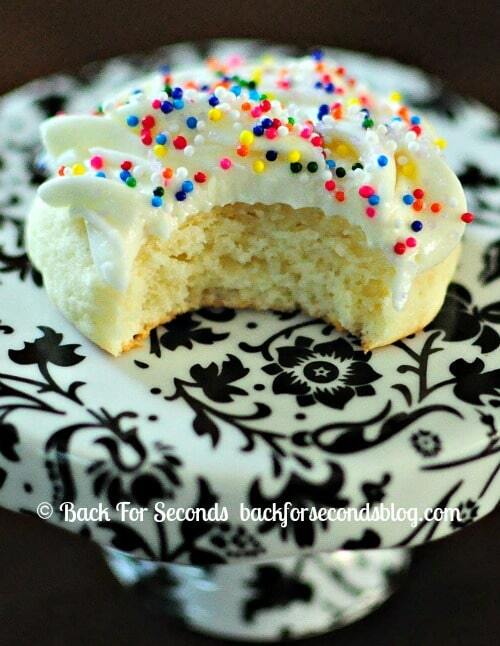 The frosting is fluffy, creamy, and full of vanilla flavor, but not too sweet. 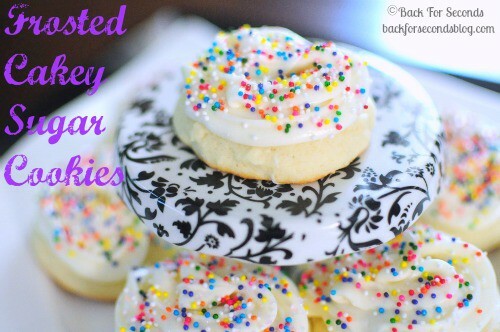 And those sprinkles just make these cookies so happy, don’t you think? Stephanie – these look amazing!! I love the colors. I followed this recipe perfectly, but it definitely didn’t turn out like everyone’s going nuts over. They’re not bad, but the dough was extremely sticky, even after sitting in the fridge for over 3 hours AND adding an extra cup of flour. Definitely a messy kind of cookie dough that isn’t easily flattened with a cup. 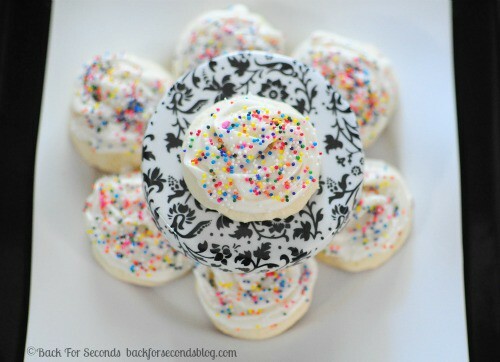 However, the frosting recipe is utter perfection and I will be saving it and using it on my next cake! Sorry you had trouble with the dough. It is a bit sticky but usually I just dust the bottom of a glass with flour to flatten the cookies and it does the trick. I’m glad you loved the frosting! I could eat it with a spoon. Thanks for the feedback, Lyndsie! I think that would be just fine 🙂 enjoy! And the frosting, how many days I. Advance before Christmas can I make and how to store, counter or fridge? I wouldn’t make it more than a couple days in advance. Store in the fridge but allow to come to room temp before spreading on the cookies. I made this cookies for a get together with my friends and they loved them. They even asked me to make them more for next time we hang out. Thanks so much for this recipe.